One of the largest cities in Morocco and the former imperial capital of the Almohads, Marrakech is divided into two distinct areas. The old town Medina is made up of narrow intertwining passageways filled with impressive museums, architectural treasures and traditional markets. At the heart of the city is the Jemaa el Fna square, overlooked by the Koutoubia Mosque. Much like a scene from Arabian Nights, each evening you’ll find acrobats, musicians, dancers, snake charmers and storytellers entertaining the masses in the historic plaza. In contrast, the French colonial Ville Nouvelle hosts contemporary restaurants and bars and is a Mecca for designer shopping. Marrakech hosts a semi-arid climate that mirrors that of the Mediterranean albeit with less rainfall on average each year. Temperatures can drop as low as 12° in winter months and reach 30° in the summer. As you would expect, the summer is hot and dry whereas winter receives the most rainfall. July is on average the hottest month of the year, but most humidity is experienced in the winter months. The medina stalls in the old town are now a UNESCO World Heritage Site. Marrakech is home to the most significant traditional souk in Morocco and sells products from spices to carpets to electrical items. Well worth a visit for a classic taste of Morocco. 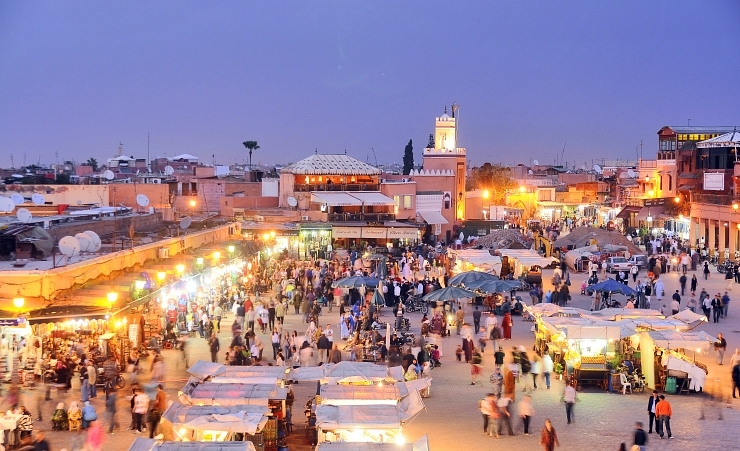 Visit Jemaa el Fna, the world famous square, home to entertainers, stall owners and – of course - pickpockets. Enjoy…carefully. •	Menara Gardens: West of the city, they have their own manmade lake as well as an orchard and a small amphitheatre. •	Majorelle Gardens: Bought by French designer Yves Saint Laurent before he died, it is home to cacti and bamboo plants among others. •	Agdal Garden: Home to a historic swimming pool where it is believed Sultan is said to have drowned. Marrakech isn’t short of Moroccan riads and palaces with grand architecture to take in. Places such as the Royal Palace are not public buildings but worth taking a trip to see. Many of the Mosques in Marrakech were built in the 12th Century, and although they are not open for non-muslims to enter they can be admired from the outside. Due to the location in the middle of Morocco, Marrakech doesn’t have any beaches, and the closest one is around 6 hours away! Marrakech is the best place for a city break in Morocco. 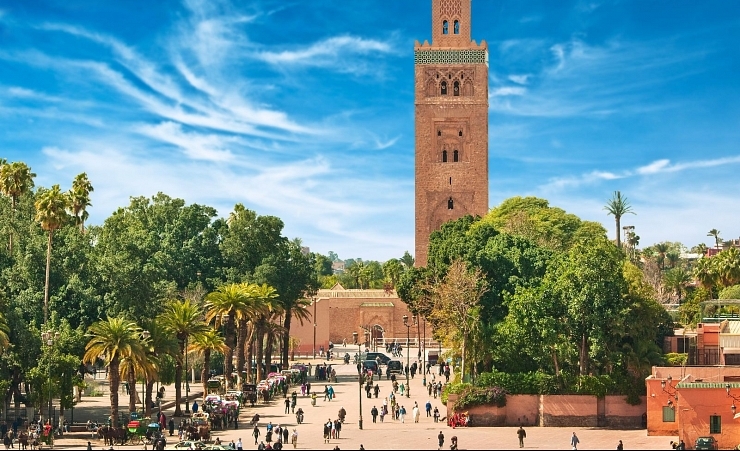 Marrakech has established itself as a cultural and religious centre for Africa. They have their own museum full of information and exhibits of traditional Moroccan art. National and Islamic festivals are celebrated throughout the year. Marrakech is home to many lemons, orange and olive groves that are all used in the cooking in restaurants, street food stalls and hotels. For a traditional Moroccan meal, try a tagine; a popular meat and spice dish cooked in a traditional Moroccan oven. Marrakech doesn’t have a huge nightlife scene due to their alcohol licensing laws meaning only a handful of restaurants, bars and hotels are allowed to sell it. Instead, spend your evenings in the Jemaa el Fna square to see live and traditional Moroccan performances of dancing, music and snake charmers. Day trips to the Atlas Mountains are available from Marrakech, hot air balloon trips over the mountains are also available and can all be arranged on arrival. 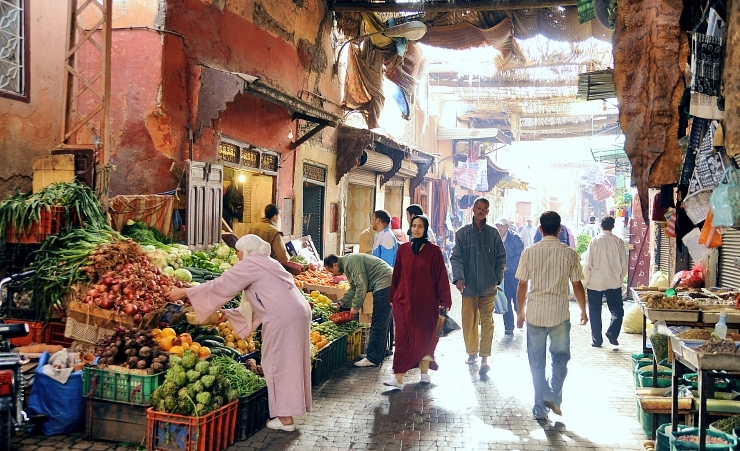 The best way to see Marrakech is on foot, but that’s not always easy. Liikewise, buses are cheap in Marrakech, but they aren’t for the faint-hearted when locals hop on too - they get busy fast. For independence in Marrakech hire a moped or bicycle, they’re small and handy to have to get from A to B.
Marrakech has its own international airport and railway station connecting it to Casablanca on the coast.